artletts Rum and Whiskey are fermented, distilled and bottled on-site in Montgomery County, Texas. Our spirits are a small batch, craft products and provide a uniqueness not found with larger distilleries. We make all of our rum with "Panela" or whole unprocessed evaporated sugar cane juice. This ingredient is key in giving our rum products wonderful sugar cane flavors that you're sure to enjoy. Come by Bartletts Distillery to see for yourself how we make these fine spirits, have a cocktail, and take a bottle home with you. Although the products are displayed on this website, alcoholic beverages may only be purchased at the Distillery or at a retail location. 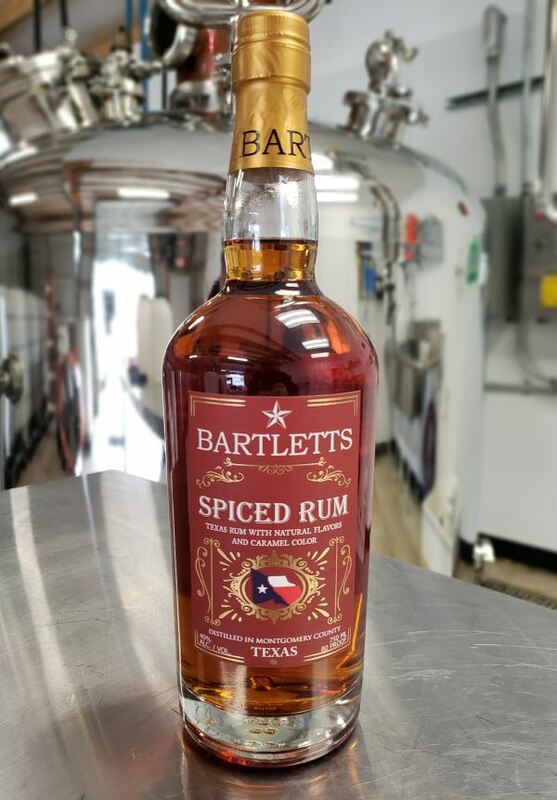 BARTLETTS SPICED RUM is infused with a unique blend of vanilla, almond, and other spices to render a unique flavor combination that will tantalize pallet. Currently available in our Tasting Room in Conroe, Texas, and coming soon to Houston area Total Wine & More stores. See our SPICED RUM ATX Wholesale Liquor page for locations. 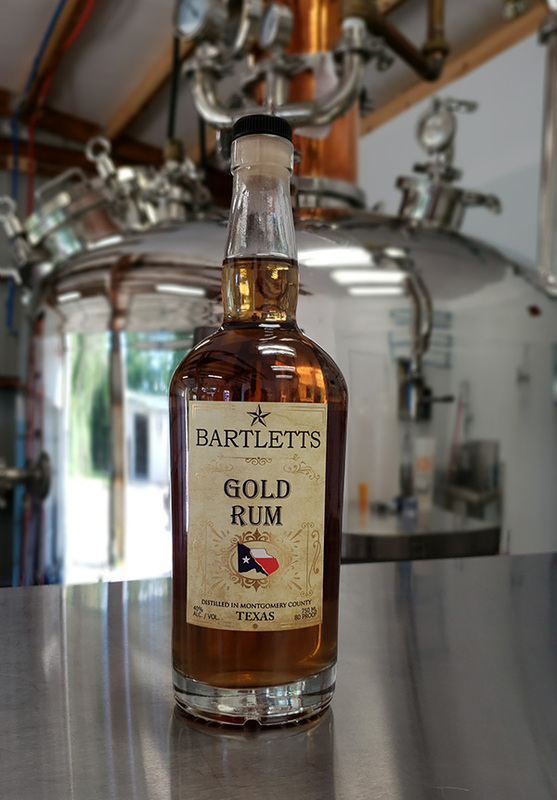 BARTLETTS GOLD RUM is the standard for our mature Craft Rum. Fermented with yeasts selected to produce a well-rounded Caribbean flavor profile and matured in small American White Oak casks, our Gold Rum is perfect for everything from a simple Rum and Coke to daiquiris and mixed fruity drinks to straight on-the-rocks. Currently available in our Tasting Room in Conroe, Texas, and in Houston Total Wine & More stores. See our GOLD RUM ATX Wholesale Liquor page for locations. 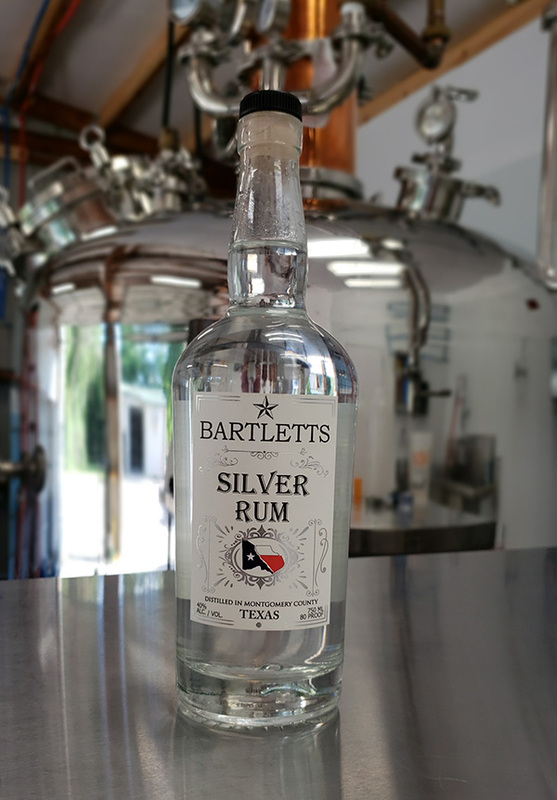 BARTLETTS SILVER RUM is a smooth and flavorful unaged spirit, perfect for daiquiris, Rum-A-Ritas, and the ubiquitous Rum and Coke. Without aging, the true flavors of the "panela" or whole evaporated sugar cane juice come through. The result is a spirit that has more floral notes than a traditional rum, and even reminds some tasters of tequila. Currently available at our Tasting Room in Conroe, Texas and at select retailers in the Houston area. See our Silver Rum ATX Wholesale page for locations. 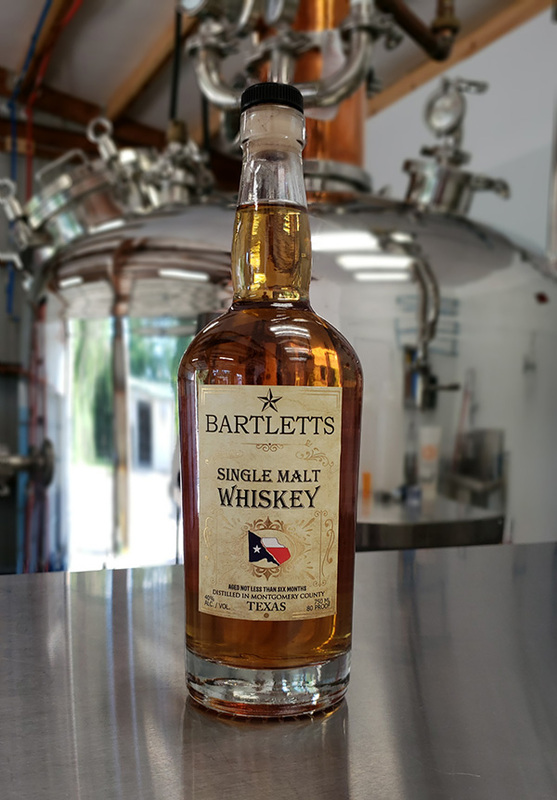 BARTLETTS SINGLE MALT WHISKEY is a smooth malt whiskey made from 100% Malted Barley. Matured in new charred oak barrels for at least half a year before bottling, the result is a smooth spirit best enjoyed on the rocks, but may also be served with your favorite mixer. Next batch available May 2019. 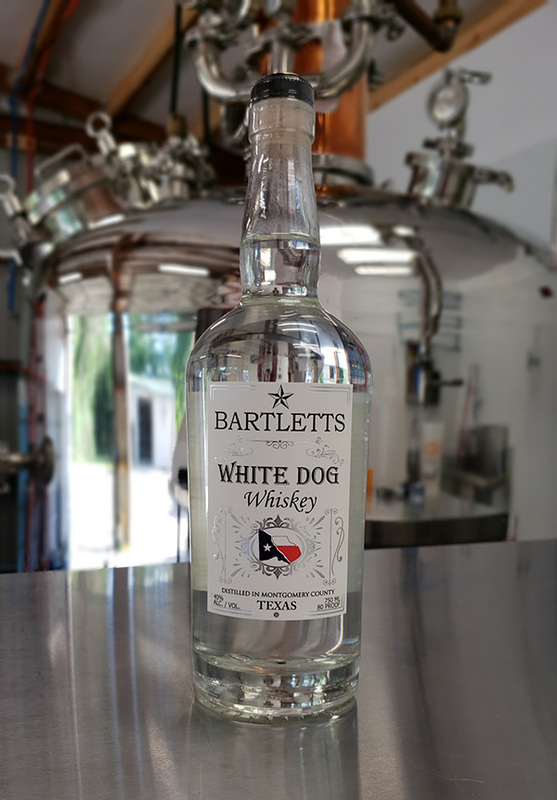 BARTLETTS WHITE DOG WHISKEY is a smooth spirit with a mild grain flavor made form 100% malted barley. This is NOT moonshine, but an unaged version of our Single Malt Whiskey. It is easily enjoyed over straight on-the-rocks or served with your favorite mixer. A very limited stock is available in our Tasting Room. 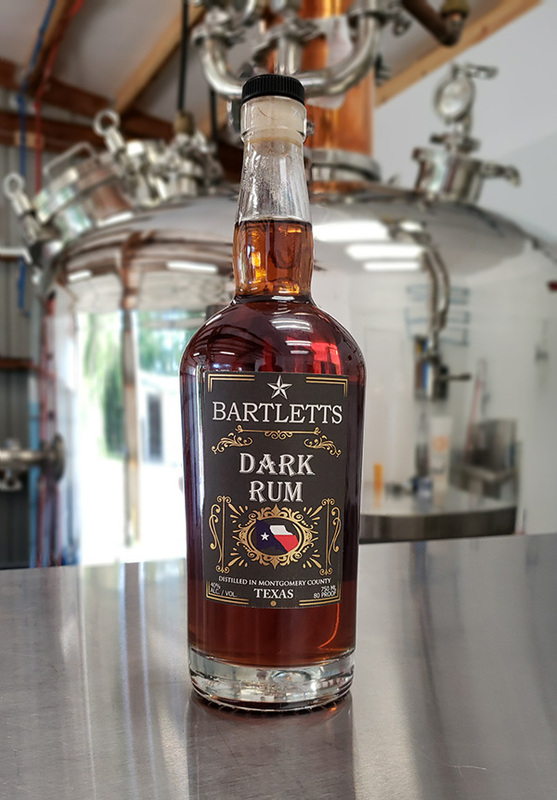 BARTLETTS DARK RUM is a full-flavored heavy rum ideally suited in classic beverages like Hurricanes, Mai-Tai's and other mixed beverages. It's also well suited to be enjoyed straight over ice. Test Batch #1 goes on sale in our Tasting Room on March 22, 2019, while supplies last.